The 1951 Bowman Baseball set consists of 324 cards measuring 2-1/16" by 3-1/8". Each simple card front displayed a player’s likeness, most of which were recognizable press photographs enhanced by painted color and embellished by the player’s name caption. The gallery includes future Cooperstown enshrinees Yogi Berra, Roy Campanella, Pee Wee Reese, Duke Snider, Warren Spahn and Ted Williams, along with rookies Whitey Ford and Nellie Fox, and numerous other stars and popular players. 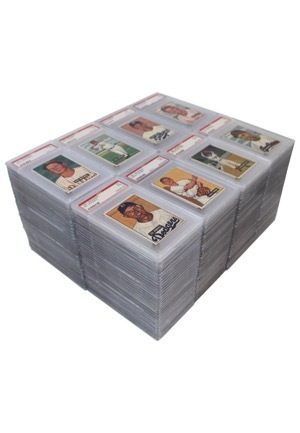 Offered is a near complete set (255) of the 1951 Bowman set. All cards have been encapsulated and graded by PSA. The vast majority of the cards have been graded a NM 7 with some graded NM-MT 8, NM 7 (OC), NM+ 7.5 and EX-MT 6.